Track of radio-tagged Short-tailed Albatross from 25-29 September 2009. 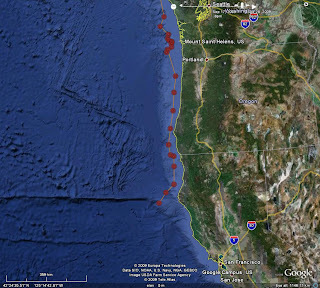 Rob Suryan, assistant professor at Oregon State University, recently sent me this map showing satellite tracking of a juvenile Short-tailed Albatross off Oregon. It spent several days off the mouth of the Columbia River, then headed south into California. This bird has an interesting story. It hatched this spring (2009) on volcanically active Torishima Island, where most Short-tailed Albatrosses nest. But when it was 1 month old it was translocated to Mukojima island where it was hand-raised until it fledged in May. Check out this interesting U.S. Fish & Wildlife Service fact sheet telling more about the relocation efforts. In 5 years or so, this bird should return to its foster home on Mukojima Island to begin a new breeding colony there. As explained at Wikipedia, Short-tailed Albatrosses were hunted nearly to extinction by 1933. Perhaps up to 10 million birds were killed for their feathers to use in mattresses. About 50 birds apparently survived, though, and with protections have increased to about 1840 individuals by 2003. The two largest risks to long-term survival of these birds is eruption of their breeding island at Torishima, and the Alaskan long-line fishing industry, which has worked hard to eliminate accidental bycatch of seabirds in recent years. These albatrosses spend the non-breeding season feeding in the rich waters of the Aleutian Islands of Alaska. Immature birds, less than 3 years of age by plumage, are rare but regular visitors on the US West Coast. Three previous radio-tagged hatch year birds moved past Oregon and into California, briefly, before heading back to Alaska. The previous logged visits were November 2003, October 2006, and November 2006. Oregon has a total of 15 records of this species since 1961, primarily September-March. Nine of these have been since the year 2000. As with all albatrosses, they are highly attracted to fishing boats and the chum offered by pelagic birding boat trips. Historically, Short-tailed Albatrosses also favored inshore habitats more than other species. It is interesting to see how this individual stayed over the shelf during most of the observation period. Angus, in answer to your question on Seabird News, this albatross spent a few days off the mouth of the Columbia River, then made a quick exit south into California. We saw a radio-tagged Short-tailed Albatross on Oct. 11, 2009 off the coast of Half Moon Bay in Cailfornia (29 miles out). It was following a small trawler when we found it. There was also a Laysan Albatross. Photos are at my flickr account, "kristenolson". It has a red band on its left leg(the marvels off digital photography) Y18. Great to hear more about it!! We had gotten early maps from Rob Suryan.